Dexter Daily: Michael C. Hall: "It's the Most Fundamentally Game-Changing Development We've Had"
Michael C. Hall: "It's the Most Fundamentally Game-Changing Development We've Had"
Via: TVGuide.com, by Natalie Abrams: Now that Deb knows her brother's big secret on Dexter — that Michael C. Hall's titular character is a serial-killing blood spatter analyst — it's the beginning of the end for the Showtime series. In the Season 6 finale, Deb (Jennifer Carpenter) rushed to the church to profess her love for Dexter, only to find him plunging a knife into the heart of the Doomsday Killer (Colin Hanks). The seventh season will pick up right immediately from the finale, with Deb confronting her brother — something Carpenter has been dying to play. "It's the strangest, scariest seduction scene, in a weird way," she said. "I have been looking forward to it. I was very curious about how they would write it and also terrified. I didn't want Debra to lose any sort of credibility with the audience. I think it was imperative that [she] finds out while [she] was already trapped in this web of acceptance for him." "Without a doubt, it's the most fundamentally game-changing development that we've had," Hall added. "One of the things we've always been able to count on is that Dexter's secret is his own, and it's not anymore." As a result, Season 7 will pose new questions, including whether Deb will turn her own brother in — and what he might do to stop her from doing so. "Dexter is a serial killer. The thought has to at least have crossed his mind at some point that that would be an easy solution to this problem," executive producer Scott Buck said of whether Dexter considers just killing his sister. "We don't shy away from the reality that there's no easy way to deal with this situation." While fans have been waiting patiently — and sometimes not so much — for Debra to finally catch on, Buck and Colleton said the time was ripe heading into the final two seasons for it to happen. "We knew we would always eventually tell the story, but because it so dramatically changes the nature of the story, we didn't want to consider it until we were closing in," Buck said. Added Colleton: "We thought, 'OK, this is the right time for this to happen.'" Deb won't be the only woman Dexter will have to deal with this season. Not only will La Guerta (Lauren Velez) make a startling discovery in the premiere, but Chuck's Yvonne Strahovski will intersect with Dex beginning in Episode 3. "It's safe to say that Hannah McKay has a dark past that is slowly revealed as the episodes go on," Strahovski said. "She holds some secrets. She meets Dexter because she's helping the Miami police department with a case. It's a case that's been around for a while." 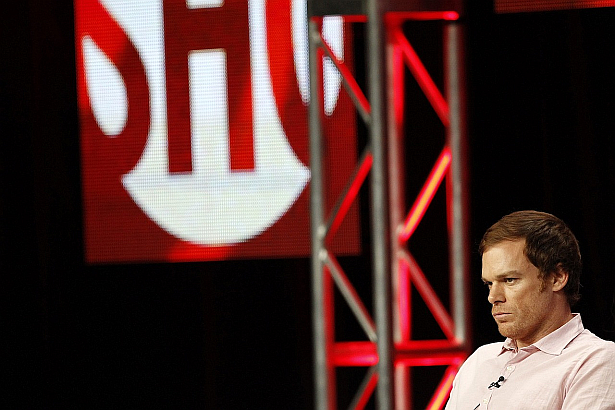 Still, Hall says the more problems Dexter has is exactly what will make the seventh season so enticing for viewers. "Dexter is never more compelling than when he's in trouble and he's never been in deeper trouble than he is in now." He doesn't have a badge. He has a laminate! Why does Deb knowing spell the end to the series? In the book series she knows and it works just fine. She doesn't necessarily approve, but uses his intuition to help solve cases. Because Book Deb and TV Deb are two totally different characters. Book Deb is Harry Jr., she is a good cop, believes in justice, but she's willing to look the other way and at times, even encourages Dexter. Book Deb's a bit of an enabler. And, at times, she proves herself to be Dexter without the desire to maim and dismember. TV Deb, on the other hand, is much more deeply emotional character who is a foil to Dexter's lack of emotion. Even Book Deb has some trouble reconciling whom she thought Dexter was to who he really is; TV Deb will have a hell of a job reconciling the two Dexters. Not to mention, if possible, TV Deb's even MORE reliant on Dexter than Book Deb is. It doesn't necessarily mean that she'll turn Dexter in at the end of the day, but her knowing his secret is the path to Dexter's endgame, whether it be a prison cell, a sandy beach with Deb/Hannah, or shallow grave. here's the nail, and you just hit it on its head. if I would have replied it would have looked much like yours. couldn't agree more. Yea put me in for 3/3 on this one, though I am solidly in favor of the sandy beach with Deb.